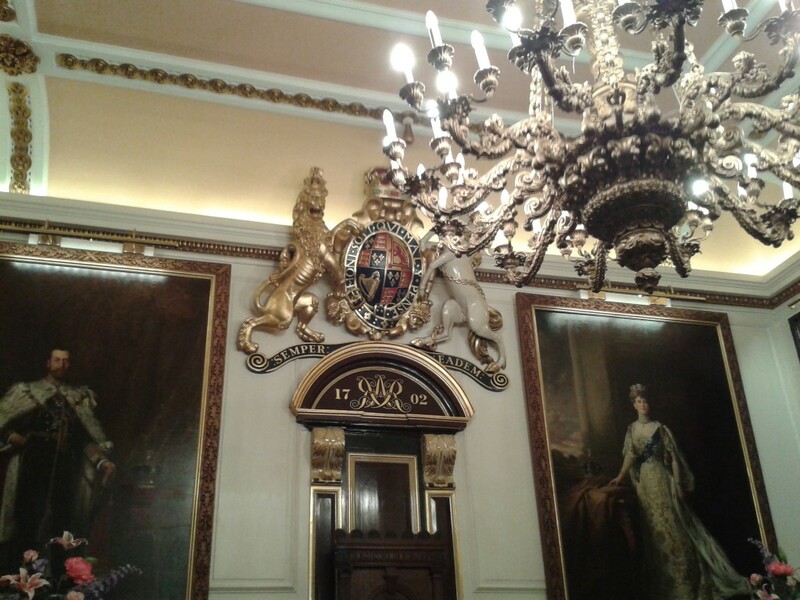 Last Monday night, I attended Elizabeth Chadwick’s talk at the Guildhall here in Windsor. I was lucky as I booked only the night before and I was surprised there were any tickets left. Elizabeth Chadwick is a very popular and successful historical fiction author, whose books have been translated into numerous languages. I’m very pleased to be connected to her on Facebook, where she posts little excerpts from her WIP (Work In Progress), research photos and more. I really hope you noticed the ‘1702’ above the doorway. 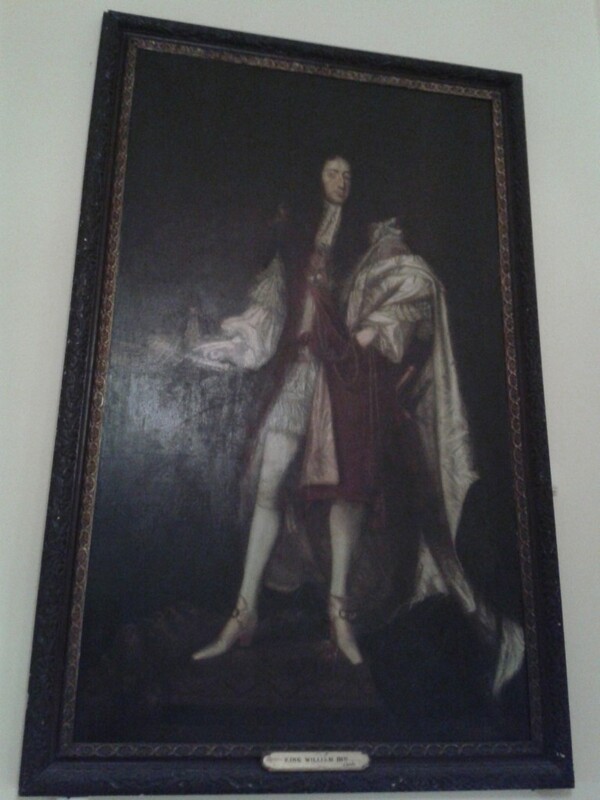 1702 was the year in which William III died and Anne came to the throne. Note the beautiful portraits of King George V and his queen consort Mary of Teck. 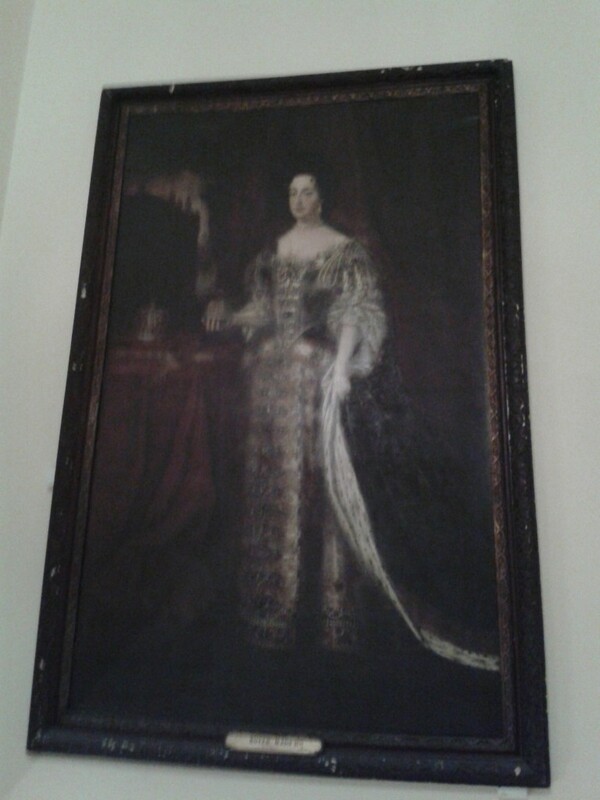 The room had paintings of Elizabeth I, Anne, the Georges, and other sovereigns and it was beautiful. It’s a beautiful room in a beautiful building. 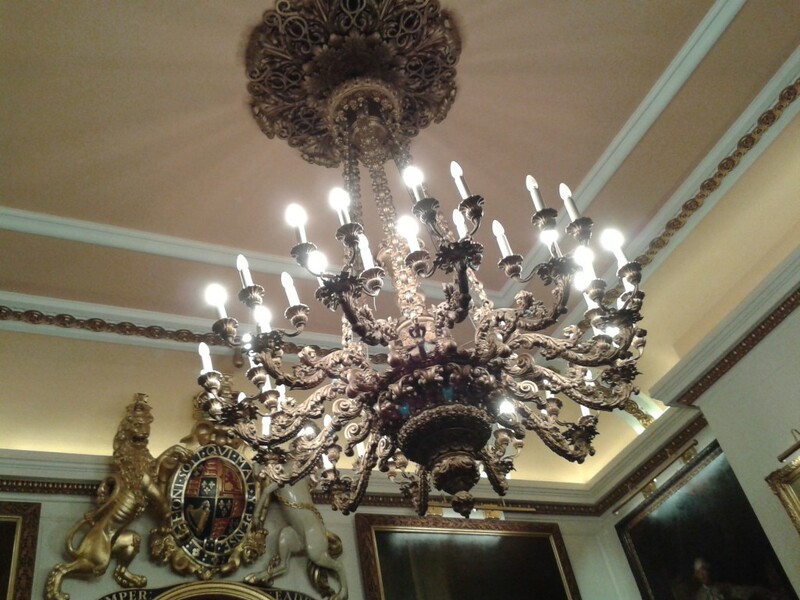 Take a closer look at that chandelier! Although I had visited the Museum which is in a small part of the Guildhall, it was the first time I have been able to enter the main part of the building (which was constructed during the reign of William III). Inside, I was pleasantly surprised with two large paintings of William and Mary, which face each other on opposite sides of the double staircase. I had no idea these were here! I think they could use some restoration as they appear to be quite dirty (which is only fair as they’re over 300 years old!). But art restoration is rather costly. Anyway, I asked the staff if I was able to take photos and they very kindly said I could, so here are some photos of the paintings. I’m sorry for the bad quality, but it was very dim in this section of the building and I only had my mobile phone camera. Going back to Elizabeth Chadwick’s talk, she talked about her research and writing methods and I was really interested in hearing what she finds useful. She is well into historical reenactment – something I’ve done in the past – and I agree that it really helps one understand how people lived back then when you use the cutlery, cooking pots, etc from that time. I agreed with her on a good deal, especially in visiting sites in which historical events took place. Now, I think we can remember how disappointed I was when I went to hear Michael Hirst’s talk at Hampton Court Palace, only to learn that he hadn’t visited HCP during his writing of The Tudors. I think a huge amount is to be gained by visiting a place before – or during – one’s writing. Chadwick came across as very pleasant, knowledgeable, and passionate about her subject – she also told us of her job stacking shelves in order to make ends meet before her writing career took off. I don’t know how people like her do it, she was married, was raising children, working, and researching and writing. I don’t think I could do all that! She asked what my time period was, and I replied it was the 17th-century. Her reply was extremely inspirational and she pretty much told me to keep writing until a big publisher/agency notices. I will do my best. 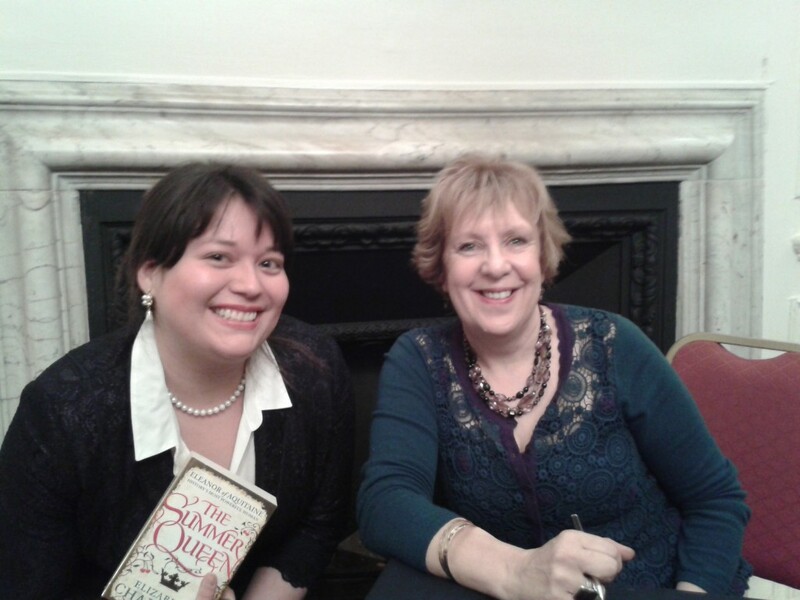 Afterwards, she signed copies of her books and was kind enough to take a photo with me. This isn’t my best photo, but I don’t care – I got to meet her and she was super LOVELY. 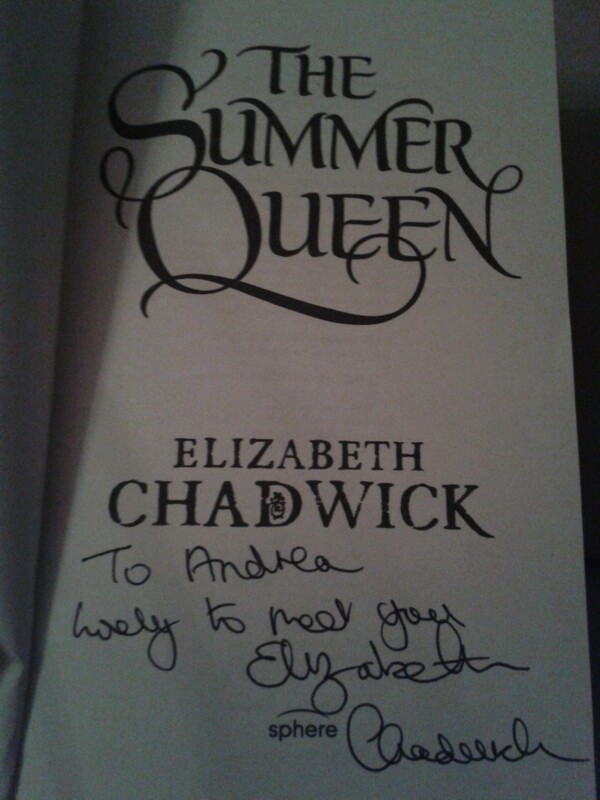 She signed a copy of The Summer Queen, which is about Eleanor of Aquitaine. In her book, Eleanor is named “Alienor” – the spelling which the real Eleanor would have had, apparently. Below is a photo of her signature. It was a truly lovely evening and it left me feeling inspired and positive about my own writing. Thank you, Elizabeth! Sounds like it was both an enjoyable and useful night out! Will Mary be Mary in your new book, or will she be Marie as in her signature?